Are you staying on top of current trends? If not, find out how new National Restaurant Association research can help you navigate challenges and leverage opportunities this year and beyond. Q: It’s been seven years since the end of the Great Recession. Is the economy still a challenge for restaurateurs? HR: Restaurant operators tell us that the economy is still a top challenge. While key indicators are trending in the right direction, overall economic growth has been modest, and recovery has been slower than in previous post-recessionary periods. Consumer confidence remains somewhat fragile, although gasoline prices have fallen over the past year. Despite some challenges, there are a few bright spots, such as wholesale food prices trending down. HR: There is significant variation in the operating environment among regions of the country. Local restaurant communities are affected by regional demographics, such as employment and population growth. We’re also seeing some dramatic differences in consumer confidence: Consumers in the West North Central and West South Central regions generally are more positive than those in the Middle Atlantic, for example. Q: Recruitment and retention is creeping back on operators’ list of top challenges. Why is that? HR: As job growth continues to advance on a national level, employment levels are ticking up, leaving a shallower labor pool. The restaurant industry also is adding jobs at a faster pace than the overall economy, and about one in five restaurant operators report job openings that are difficult to fill. Q: What are you seeing on the consumer trends side? AS: A typical restaurant guest today is very different than 20 years ago. Now that dining out is an everyday activity, consumers are much more experienced when it comes to food and restaurants. And they’re much more engaged in their dining decisions. They look for an experience at each restaurant visit, and they use a more complex decision matrix based on wider lifestyle choices to make menu selections. Q: What are the top food trends across the industry right now? AS: A lot of current food trends are growing from ever-increasing consumer interest in what’s on the plate and where it comes from. Today’s top menu trends are becoming more theme-centered than item-focused. The nutrition, local sourcing and eco-friendly trends are growing stronger. Global flavors also are gaining momentum, signaling that consumers are more sophisticated and adventurous today than ever. 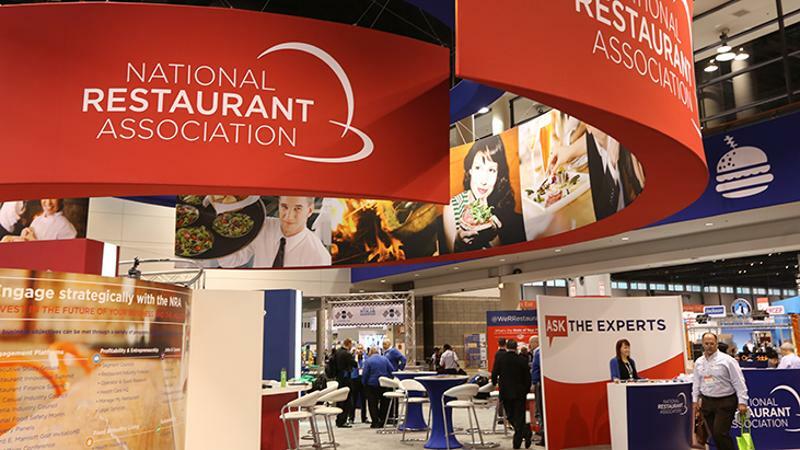 To learn more about the National Restaurant Association’s research, visit Booth 6600 at the entrance to the North Hall, or go to Restaurant.org/Research.